pie in the sky: New Study Says Bacon is Good for You! An article in the New York Times today brings to light a new study on the nutritious benefits of bacon. Have you ever been advised not to freeze bacon? That's because it contains a particular kind of insoluable fat that breaks down easily when frozen...or cooked! In fact, the study shows that this bacon "super-fat" not only resists absorbtion into the body - it also binds to other fats and keeps them from being absorbed as well! So never again ought we omit the bacon from our breakfast scramble - that bacon could be saving us egg calories! In fact, when shopping for bacon, it would be nutritionally advisable to avoid purchasing the leaner cuts. The study advises readers that these fats are present in bacon cuts only - not the whole pig. So for you salami- and pork-chop-lovers, don't think these means you can up your consumption. 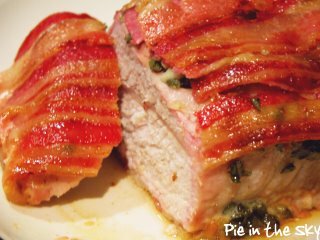 But if you do continue to indulge in these non-bacon cuts - be sure to wrap them in bacon! On the bright side, several real, actual studies say that lard is not the worst fat you could be eating. It's definitely not as bad as trans fats or beef tallow, and it's not even as bad for you as butter. Of course, I eat a fair amount of butter, so either way I can't win! Damn. You really had me going there, girl. Especially because I have been known to freeze bacon so that I don't eat the whole darn package all at once! That cat picture is awesome!! this joke compares with you finding the last piece of the puzzle, after I hid it in a vase on a shelf so I could put in the last piece. when i am cooking i usually add bacon because the taste is really delicious. Actually the bacon for the breakfast is really good i enjoyed a lot. Although the ingredients of the meals be simply if you chose the right ones,the taste will be wonderful.